ailed back syndrome refers to chronic neck pain or back pain after surgery. That is, surgery did not achieve the desired outcome, and the patient has difficulty returning to normal activity. Unfortunately, most cases of failed back surgery syndrome can be avoided by more careful preoperative patient screening. All too often, an MRI finding will not actually correlate with the patients’ symptoms. As a result, the actual painful pathology is not addressed. The pathology continues after surgery, only now the patient also has surgical pain and scarring. Failed back syndrome can also result when surgery does not adequately restore normal spinal alignment. 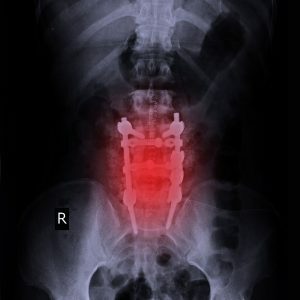 For example, if a spinal fusion surgery is performed on the neck or lower back without attention to restoring a gentle backwards curve (lordosis), then the resulting forward bend can lead to chronic muscle fatigue, spasm, and pain. If a spine surgery results in failed back syndrome or pseudarthrosis, a patient will usually require a repeat procedure for correction. This is never a favorable situation, because repeat or salvage surgery involves scar tissue that obscures normal anatomy, and increases risks of complications, such as poor wound healing and nerve damage. The goal of spinal fusion surgery is to have bone grow across a joint, fusing that joint together. Metal screws, rods, and plates aid this process. If the bony fusion does not occur, then eventually the metal implants will become loose, and the joint will become painfully unstable. This is called pseudarthrosis. Pseudarthrosis typically occurs when the patient is a heavy smoker, a diabetic, or has poor bone quality. It requires a repeat surgery to correct. The elite team of neurosurgeons, also spine surgeons, physiatrists, and non-surgical pain management physicians, and physical therapists at North Jersey Spine Group (NJSG) are renowned in treating 20% of patients who have unsuccessful therapies and surgeries at other institutions. NJSG offers multiple offices spanning Bergen County to Hudson County and surrounding towns including Montclair, Parsippany and Sparta, NJ. The team at North Jersey Spine Group are the experts in spine care, from minor conditions that respond well to conservative treatments, to more serious conditions that may require complex surgery. Through personal attention and compassion, the award-winning group uses cutting-edge technology to ensure faster recovery for each patient. Northern NJ patients are welcome to contact NJSG today.